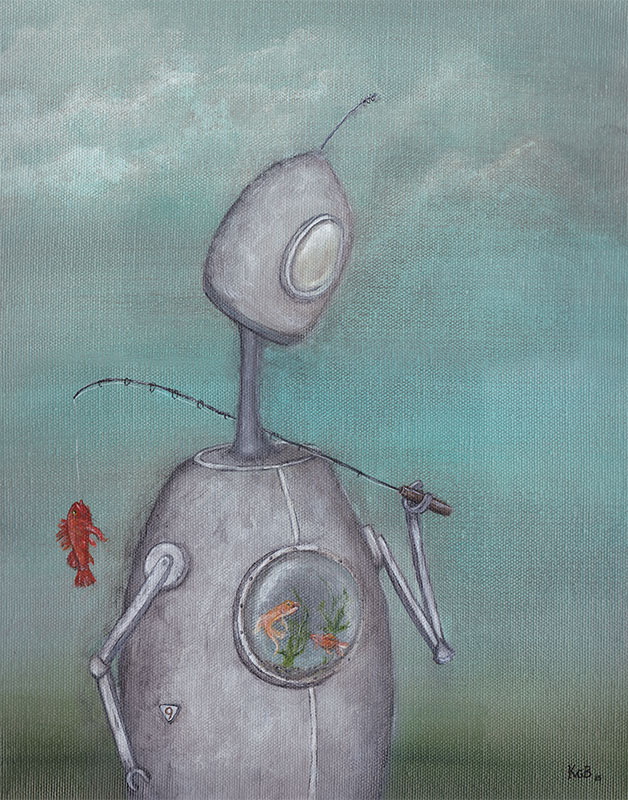 My newest addition to the robot portrait series is Walter (Robot no.9). An amateur fisherman, Walter got hooked on the pastime after spending summer holidays at his uncle Stan’s cabin in Saskatchewan. He loves to spend time on the water, despite the constant need to refresh his TruCoat Rust-Proof finish. He also enjoys campfires, s’mores & milkshakes. He hates sushi. After sketching him out on paper months ago, I finally worked in some studio time to bring him to life on my canvas just in time for the Eastside Culture Crawl. 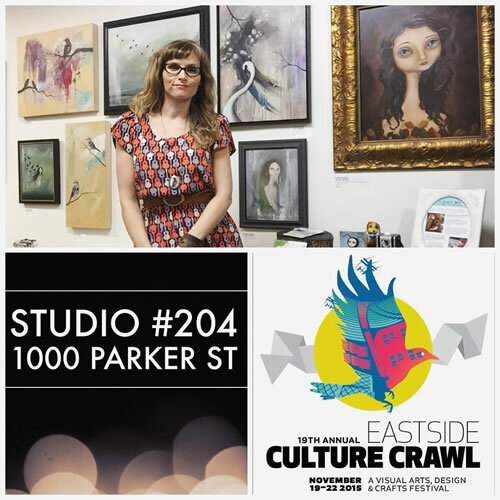 We had a record number of visitors through our studio space in the 1000 Parker Street building. I love seeing familiar faces & chatted with so many people who have seen my work at other markets. Such a treat to peek behind the scenes & see where artists create! I tried to sneak out of my studio a few times to check out other artists in the building. So much talent under one roof! Unsurprisingly, Walter was one of the first paintings that sold during the Crawl, but I have him available as both small & large wood block prints covered in glossy resin. He’s hanging here with Rupert (robot no.5) and Cecil (robot no.3). 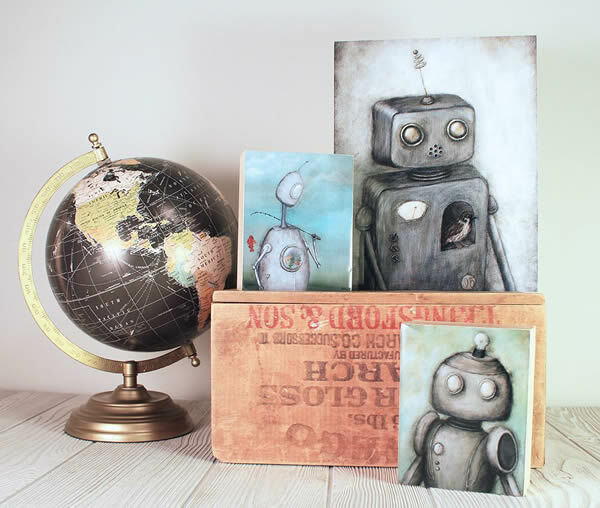 The art blocks are a great way to display your favorite robot on a desk, bookshelf or hung on the wall – no framing needed. I mount the archival paper prints onto birch wood panels custom made for me in Canada. After a few coats of sealer, I pour an artist grade resin on top to give them a glossy finish that makes the colors pop. The blocks are sturdy enough to stand on their own, but since the backs are hollow, still light enough to be easily hung on the wall from a couple of thumb tacks. To order, email me directly at acageybee@gmail.com or click here to visit my Etsy shop.